A little while ago, I went to the post office, to look for the Lewis Hine stamps. “The what?” asked the clerk back. “The Building a Nation ones.” Those they had. I suppose technically speaking, they are not really the Lewis Hine stamps, given he took only eleven of the twelve photographs used. But you’d still imagine that postal employees might have a better idea of what’s on the stamps. However, the stamps don’t give the photographers’ names. They offer “USA” and “Building a Nation” and “forever”. To tell you the truth, I never thought very highly of the pictures used for the stamps. They are, you know, fine. And if these were all the pictures Lewis Hine had produced in his lifetime, I might be bit more forgiving. But they’re not. I was reminded of that, yet again (not that I didn’t need much of a reminder), when I saw a feature the other day entitled Tracking Down Lewis Hine’s Forgotten Child Laborers. Now those are the pictures that I think should have made Lewis Hine a household names, at least a name in the circles of photography; but I’m not sure that’s even the case. It’s most curious. It’s relatively easy to make the case for these photographs, since a whooping 5,123 are available online, in the Library of Congress’ National Child Labor Committee Collection. And “available” here means really available. To give you an example, the photograph at the top of this article can be found here. The page gives the full title (“Gastonia, N.C. Boy from Loray Mill. ‘Been at it right smart two years.’ Location: Gastonia, North Carolina.”), and the Library of Congress (LOC) has both a print and the 5×7 in. glass negative in its possession. You can download digital scans of both (the above uses the negative), at very high resolutions. Not all the photographs are available this way, there are “only” 355 glass negatives in the collection (source; just as an aside, I’ve seen contemporary photographers publish books resulting from quite a bit less than 355 negatives, not even to talk about over 5,000 of them). 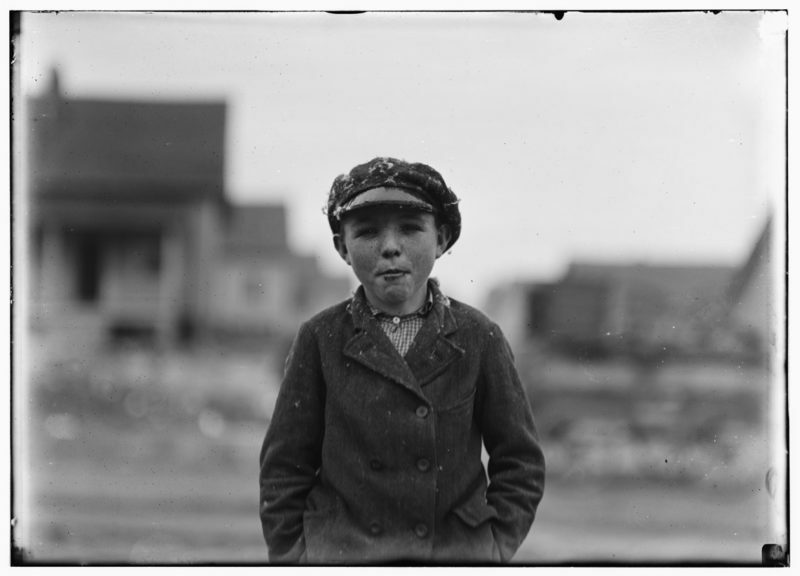 After having downloaded the high-resolution file, a scan from the original glass plate, you’re able to look at this nameless boy from Loray Mill in full detail. Slight motion has resulted in his form being ever so slightly out of focus and/or blurry. You would imagine that this would in fact ruin the photograph, but quite the opposite is the case. Instead, it serves as a reminder that this is a photograph of a living human being, a very young one, a young boy whose face tells the viewer that physical age doesn’t match mental age. And the viewer is made equal with this young boy – the camera is placed low enough not to look down. The LOC website also notes: “The NCLC photos are useful for the study of labor, reform movements, children, working class families, education, public health, urban and rural housing conditions, industrial and agricultural sites, and other aspects of urban and rural life in America in the early twentieth century.” This is correct, of course. But it seems so lacking – at least to me. The reality is that while these photographs can indeed be used for that, a large number of them are also amazing photographs in their own right, photographs that could easily stand next to, say, August Sander’s work (a large number of whose work was produced around the same time). These photographs deserve to be re-evaluated, in terms of their sheer artistic qualities. I feel the focus on labour studies or any other the other topics, while entirely worthwhile and relevant, reduces these photographs (and by extension their maker) to less than what they (he) could be. Photographs need to be seen with context in mind. Many photographs are created with a very specific context in mind, Hine’s child labour photographs in quite obvious ways. But context can also be an anchor that prevents access. I remember showing some of the child labour portraits in a class on visual literacy, I think in the context of a segment on portraits, and my students’ reaction was utterly thrilling. None of them had ever seen the pictures before. But many of them literally just sat there for a while, their mouths agape. On their own, many of the portraits do not reveal much of their context. And even where they do, the portraits are so mesmerizing that it takes a while before the viewer can start looking at the machinery or scenery around Hine’s subjects. In these photographs, there is something going on that transcends whatever might have been needed for them to serve their original purpose. These photographs speak to us in ways that the ones made during the construction of the Empire State Building don’t. The latter now look oddly propagandistic, the result of a world long lost, a world very different. The former, however, speak directly to us; many of them escape their context and talk of the human condition, of the things we will do to each other to make a quick buck, and of how we all react to being in a position we don’t want to be in, a position that might leave us with much less than what we should have. Much beyond the issue of child labour, this is an issue that has re-emerged in the United States forcefully. At the same time, these photographs show what happens when a master photographer sets up her or his camera: The results will stand the test of time and, inevitably, they will want to break out of whatever context they might have found themselves originally in.